After a string of fine recordings in recent years, including a concept album in 2014 devoted to the classic 1960s television series The Prisoner http://www.freejazzblog.org/2014/10/max-johnson-prisoner-nobusiness-2014_19.html, Max Johnson’s latest record, In the West, sees him approaching the legacy of one of the musical legends of cinema, Ennio Morricone. Of course, it’s not the first time Morricone’s been paid homage by adventurous jazz musicians; most readers of this blog will think instantly of John Zorn’s iconic Big Gundown album as perhaps the most noteworthy example. While not quite as idiosyncratic as Zorn’s inimitable renderings, Johnson’s “Once Upon a Time in the West” medley, the centerpiece of this record at over 21 minutes in length, provides a wonderfully rich and evocative treatment of some of Morricone’s most memorable music. 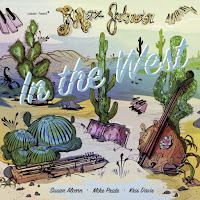 But before we get to the Morricone, we’re treated to three tracks that are almost as good, in which Johnson and his partners showcase their craft with well-constructed, highly engaging music. Johnson has selected his colleagues judiciously, with pianist Kris Davis, drummer Mike Pride, and pedal steel guitarist Susan Alcorn all able to inhabit Johnson’s distinctive compositions expertly. Johnson has a knack for writing tunes that grab you on the first listen, but which have just enough oddness that there’s something vaguely unsettling about them: really the perfect sensibility for tackling Morricone’s music, when you think about it. And though the first three cuts are all Johnson’s, they do have a bit of Morricone’s element of surprise, as for instance on the opener, “Ten Hands,” which starts with a funky, odd-metered riff, featuring Davis’s energetic runs and Johnson and Pride’s steady backing, before taking a detour soon after Alcorn’s entry, when she pushes the track in a much more abstract, ambiguous direction with her atmospheric, effects-driven musings. As the band takes the music into this more ambiguous realm and leaves the beat behind, Johnson and Alcorn together explore more uncertain terrain, only to become re-energized as Davis’s piano comes back in to define the central motif once again, and Pride’s rock-inflected drumming guides the track into more familiar territory. The same tension between the known and the unknown characterizes “Greenwood” and “Great Big Fat Person,” both of which offer ample opportunities for listeners to get lost in the moody, mysterious settings they create, while still providing enough of a tether to prevent us from being completely unmoored. Alcorn’s contributions are central, as she can veer back and forth between serenely beautiful passages and much more caustic expressions. And through the dynamic team of Johnson and Pride, both of whom can generate or release the pulse at will, the structure of the music seems always in a constant state of either emerging or dissolving. Which leads us to “Once Upon a Time in the West.” Its scope is suitably cinematic, heavy on ambience and a slowly-developing arc, with Davis’s sparse, lyrical statements essential for delineating its melodic contours. But although there are moments where Morricone’s lush romanticism shines through, Johnson is typically more content to provide oblique, sidelong glances at the melodies of Morricone’s music. The reference points are there, but they rarely fully coalesce; it’s less of an overt tribute than a perceptive re-imagining. At the same time, Johnson makes abundant room for each of the musicians’ personalities to color and shape the music as it is played, giving the music its collective character and vibrancy. And by its conclusion, we’re left with the lasting impression that we’ve been taken on a long, winding, and eventful journey. Add this one to Johnson’s growing list of impressive releases, and yet another terrific entry in the Clean Feed catalog for 2017, in what is turning out to be an especially strong year for the label.